Exercising during pregnancy is positive for both the mother and the baby. Doing modified Yoga Asanas for pregnant women can help you develop the flexibility, balance, and strength needed to have a pleasant pregnancy. 1. It helps you relax and relieve stress. 2. It allows you to live a wonderful moment in your life. You will not feel pregnancy as if it was a disease. 3. Strengthens the legs, back, and improves posture. 4. It improves lung capacity and breathing technique, which will be positive at the time of delivery. 5. It makes your hips and spine more flexible and activates blood circulation. We will focus on Asanas for the legs, hips, and relaxation. Relaxation exercises will comprehend mainly breathing exercises, which may be useful during childbirth. Our advice is to mix the different types of asanas during a session. For instance, you can do three asanas for legs, two for hips, and one for relaxation. Feel free to add as many as you feel comfortable with. Titali pose stretches the thigh and hip muscles. It helps you gain hip flexibility and warms you up to do strength exercises. We recommend doing this exercise practicing a 5-10-10 breathing cycle: five counts to inhale, ten counts for holding, then ten counts to exhale. If the 5-10-10 counts seem too long, you can try a 3-6-6 breathing cycle instead. The Goddess is an extraordinary posture for toning and strengthening your legs. You can hold this pose, or a Goddess-squat form, for three to five deep breaths. For the Goddess squat sequence, go down into your squat with arms up as you exhale. While you inhale, stretch your legs and extend your arms to the sides in a cross shape. You can repeat this sequence for five breathing cycles. When done correctly, Utkatasana is one of the most demanding beginner Yoga exercises you will find. It works on lengthening your spine and strengthening your quads. These Asanas are great to improve hip flexibility. There are cases of pregnant women complaining about getting tight hips during pregnancy. It is best to be proactive and work on your hips before this happens. Since your belly is smaller in the first trimester, this asana is safe to perform. Once your belly grows, your center may shift. You will need to be more careful to prevent a fall. Make sure you have a block to do this pose. We suggest doing the Half Moon Pose for three 5-10-10 breathing cycles. Remember to do it on both sides. No twists are recommended during pregnancy! We recommend doing the simple Trikonasana to keep the baby protected. This pose will help you stretch the front leg’s hamstring and hip. Again, we recommend holding the pose for three 5-10-10 breathing cycles and switch sides. 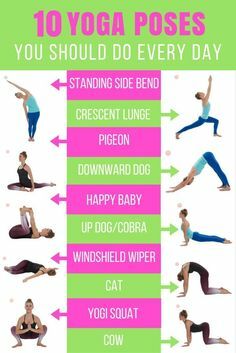 There are numerous relaxation exercises in Yoga. The best time to do them is at the end of your Yoga session, accompanying them with positive visualizations. Sukhasana is the pose where you sit with your legs crossed in front of you. You can use a wall to keep your spine straight if you need to. Do it for three 5-10-10 breathing cycles. In Savasana, the most important thing is to relax by feeling the weight of your head, back, and extremities on the mat. During Savasana, you start breathing normally. You also focus on releasing all tension while bringing beautiful thoughts to your mind. Virasana is a great posture for those who do not have knee problems. First, you sit on your heels. Then, while keeping your knees together, you separate the feet. Your hips should rest on the floor, and your back should be straight. – Stay hydrated. Place a bottle of water near your mat and drink often. Do not wait to be thirsty. Avoid soda and other carbonated drinks. – Keep it comfortable. During the first quarter of pregnancy, you can have a normal practice. Just do not push yourself too hard, and reduce the duration and intensity of asanas as needed. – Avoid twists, and ask your doctor before performing any inversions.